Cockscomb flowers (Celosia cristata) are also known as crested celosias and wool-flowers.They are annual growing plants that are originally from South Africa. 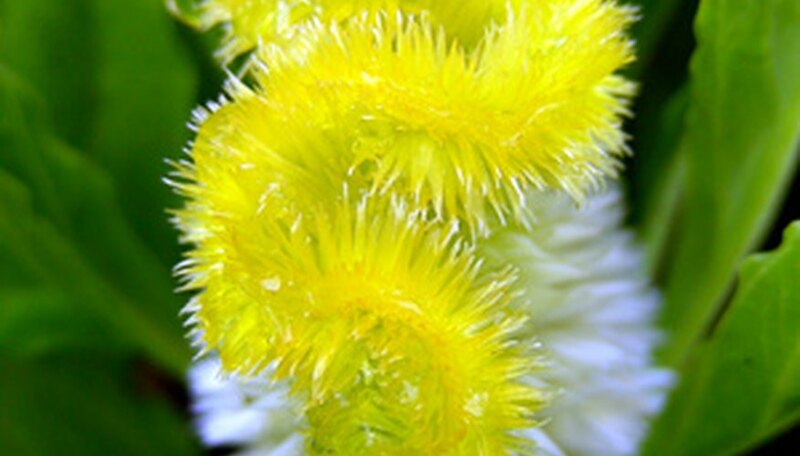 Cockscomb flowers are easy to recognize thanks to their unusual flowers; one variety resembles a rooster's comb, while the other variety resembles a bunch of feathers. Plan on starting cockscomb from seed indoors about four to five weeks before the last spring frost. Pour a sterilized seed compost into individual 3- or 4-inch peat pots until they are full. Cockscomb does not take well to being transplanted. Using peat pots will prevent any transplant shock. Dampen the compost with water using a spray bottle until it feels damp when touched. Pick up two to three cockscomb seeds using a pair of forceps or tweezers. The seeds are very small. Using a pair of tweezers or forceps makes handling the seeds much easier. Place the seeds onto the surface of the soil in each of the peat pots. Scatter a thin layer of compost, about 1/4 inch, over the cockscomb seeds. Lightly mist the compost with water to secure the seeds in the compost. Place the peat pots where they will receive a temperature of 65 to 70 degrees F during the night and 80 to 85 F during the day. Do not provide light until the seeds germinate. According to Cornell University's Flowering Growing Guide, cockscomb seeds will germinate in about 14 to 21 days. During this time frame, the seeds must never be allowed to dry out. Mist the compost with water at least once a day. Transplant the cockscomb seedlings into your garden in about four to five weeks. Choose a planting site for the cockscomb seedlings that is going to give them full sun every day, at least eight hours. Amend the soil in the planting site to improve fertility. Cockscomb requires soil that is high in organic matter. Spread out a 3- to 4-inch layer of aged compost, dehydrated steer manure or other organic material over the soil in the planting site. Use a garden fork or shovel to turn the soil over to thoroughly mix in the organic material. Dig planting holes between 18 and 24 inches apart, depending on the variety of cockscomb flowers you are growing. Each hole needs to be about twice the diameter of a peat pot, and about its same depth. Place a cockscomb seedling into a planting hole. Push the soil in and around the seedling firming it down with your fingers as you proceed. Mix together into a gallon of water 1 to 2 tbsp. of a 6-2-4 or 15-5-10 starter solution plant food plus root stimulator. Water each of the cockscomb seedlings with at least 2 cups of the solution. Water the cockscomb plants with at least 1 inch of water every week if there is no other source of water provided like rainfall.